As I get older I become increasingly vain and desperate to keep the boyish good looks that broke so many hearts in my early twenties. Some would say this has become something of an obsession or borderline paranoia. As I bat back to those who poke fun, there really is nothing wrong with a healthy dose of OCD! When a new or interesting product that promises to recharge my skin with energy and leave it moisturised appears I just can’t help myself. 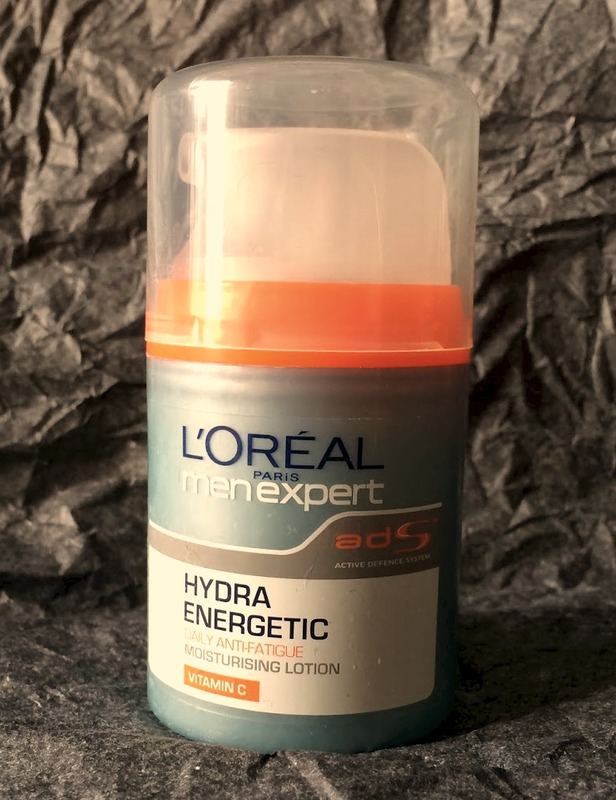 L’Oreal Men Expert Hydra Energetic Anti-Fatigue moisturising lotion crossed my path after I had run out of Dead Sea facial scrub. I was desperate to try and find something that would invigorate my skin and leave it feeling smooth and moisturised. The product is now a firm favourite and I have at least three tubes at any one given time. The moisturising lotion forms part of the L’Oreal Men Expert range of facial products, designed as a daily active defence system used to help nourish, moisturise and refresh the skin. The leaflet that comes with the lotion goes to great lengths to explain that using the anti-fatigue lotion will increase softness, form a layer of resistance to pollutants (which is good as I work in an office on one of the most polluted roads in Europe!) while leaving skin feeling refreshed, smooth and looking totally refreshed. I’ve lived in London now for 10 years and I have to say that the air quality does impact on my skin (and lungs but they haven‘t come up with a cream for that yet). When I first tried this I was having a daily commute that involved filthy air on the Underground and being blasted by exhaust fumes when I surfaced up to street level. It really was a case of nothing ventured, nothing gained. Using the lotion is easy and thanks to the pump dispenser you are unlikely to end up with a hand full of the lotion or not enough to cover your own nose. This serves two purposes that add to the positives. One press of the pump and a pea sized amount of the blue/green lotion is dispensed. The strange colour and strong fragrance are the first things to hit home. Once it has been dispensed the lotion has a quite thick consistency and remarkably doesn’t soak into the palm of your hand. It doesn’t start to be absorbed until you actually rub it onto your face meaning none of it is lost during the application process. As it is rubbed onto the face the smell of the lotion increases in strength and the crisp, clean fragrance lingers for a while. If asked to sum up the actual smell I would have to say that it has an almost clinical edge to it, but thankfully I am a big fan. After rubbing between my palms and then gently massaging the lotion into my face a quick glance in the mirror showed that indeed only a pea sized amount is needed to cover every inch, including my Tefal sized forehead! As soon as it touches an area it seems to be absorbed as quickly as it is applied. As it is a moisturiser the first few minutes after applying do leave your face looking a touch wet, if not greasy but as it completely dries in this appearance fades in no longer than 2-3 minutes. Once it has been applied there was no irritation but a slight tingly sensation as though a cold wind had just blown in my face which I can only describe as refreshing. This it seems is due to the caffeine. My daily facial routine starts with shaving, then the use of a Dead Sea Mineral facial peel followed by using the L’Oreal Men Expert Hydra Energetic anti-fatigue moisturizing lotion and I have found this to produce the best results for me personally. Since my stocks of the facial peel have been depleted I just use the lotion and whilst the results are not as good as previously, my face and condition of my skin is still ten times better than prior to using it. In terms of results regardless of my facial routine I could not be happier. Immediately after applying my skin feels incredibly soft and smooth. Over the longer term I’ve noticed that I don’t suffer as much from the patchy, dry or blotchy skin that has plagued me since I moved to London and best of all, the lines of my forehead do not appear as pronounced as they did prior to using this lotion. That’s right those Gordon Ramsey forehead trenches are reduced in size. The lotion is widely available both online and from most large supermarkets and is priced between £5 and £7 for a 50ml tube. Personally I paid £6.49 for my last tube. While I think this is expensive for a moisturiser it does live up to its billing and the claims made. It’s money well spent. Not only does it smell pleasant, it also leaves my face looking moisturised, visibly less tired and lasts for at least 4 weeks when used on a daily basis making it in real terms very good value for money. I have now found a product that does everything it claims to do and I won’t be switching to any other brand. In the world of male grooming products, L’Oreal Men Expert Hydra Energetic anti-fatigue moisturising lotion is king. This sounds great, my partner could do with this! He is naughty and doesn't use any skincare! I need to give this product a try, always looking for new items for my morning routine.